With our video converters you don't have to burn your files straight after conversion if you don't want to. You can also burn your converted files as many times as you want if you keep them on your hard drive. First, set the following parameters (see screenshot 1) : in "Settings" "Burning" , make sure the following options ARE NOT CHECKED : Burn result to DVD" and "delete folder after successful burn", you can also turn off the option, when you see the following dialog to burn. To burn your saved project, go to "action" and click on "burn an already converted project" (screenshot 3), a window opens, go get your file (only the VIDEO_TS) and it will burn when you insert a DVD. You can burn your file that way as many times as you want. In Settings/General Settings/ Burning, on the right hand part, make sure the option "Delete source file after successful burn" IS NOT checked. 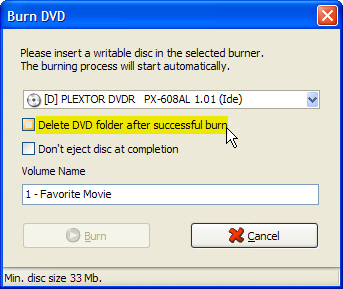 then browse for your file and it will start burning when you insert a DVD or Blu-ray. You can burn your file that way as many times as you want. This is where your converted projects are kept. Feel free to change the destination folder , but always indicate it here. Last edited by Annelise on Wed Dec 10, 2008 1:09 pm, edited 1 time in total. this also means you can burn another copy without having to go through the whole conversion process again. Thanks Annelise for the guide. You can burn another copy at any time even if you have not kept the converted files on your hard drive. Simply make a new folder on your hard drive and copy the VIDEO_TS folder from your already burned DVD to that new folder. Then "go to "action" and click on "burn an already converted project"" as Annelise said, choose the new folder, and burn. How to save menu text settings with ConvertXtoDVD ? How to check the converted video before burning ? How to merge video files and join video files together ?